A slow burning, well-crafted and brilliantly acted little drama. 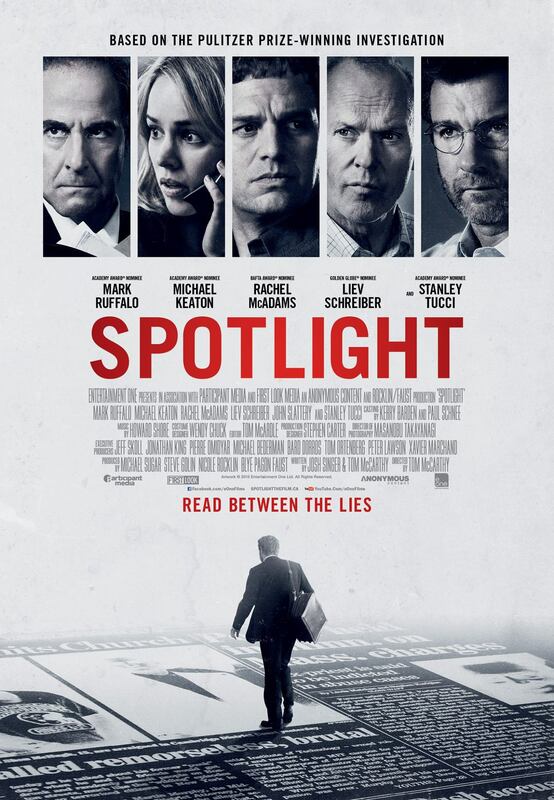 Spotlight is the true story of how the Boston Globe uncovered the massive scandal of child molestation and cover-up within the local Catholic Archdiocese. One that would shake the entire Catholic Church to its core. An intriguing opening sequence piqued my curiousity as we witnessed a priest being released from the police station. No questions asked. A shrug from the police and two priests riding off into the darkness. BUT after that promising opener, the first twenty minutes was a little too slow for my liking. I could feel myself slumping into the seat as we waited for the stellar news team to find their story. Once Marty Baron (Liev Schreiber – Ray Donovan) was brought to the fold and Spotlight’s sights were set on a priest, that was a repeat offender, I was hooked to the very end. Schreiber was very good as the mysterious Miami media man. Taking on the Boston Globe and determined to use Spotlight’s abilities to their fullest. I wanted to see more of his performance. BUT it wasn’t his story. The Spotlight cast couldn’t be faltered. It’s great to see Micheal Keaton’s resurgence after Birdman. He played Walter ‘Robby Robinson’ with aplomb. I felt every one had their moment to shine. I wasn’t sure why Ruffalo in particular was considered for an Oscar nomination BUT it was still a sterling turn from the Avenger. His anger coming to boiling point at the scale of this horrific cover up in a fantastic rant. “Mitchell Garabedian. He’s a character”. I couldn’t think of anybody better than Stanley Tucci (Hunger Games) to take on the paranoid skeptic. A lawyer intent on getting justice for his clients. Treading carefully. Afraid that the Church are watching his every move. Not enough of him. The lies, the cover ups. Afraid to mess with the Church. A “holy” institution that took advantage of so many. The statements from witnesses was harrowing stuff alone. Confused children sleeping with priests because they were afraid to “refuse” God. Just when I couldn’t be more surprised at the stories and the statistics, the team would discover another revelation. One that was too close for comfort for one member of the team. Discovering that a treatment centre for “reformed priests” was located right around the corner from his home. Rachel McAdams’ (True Detective) crazy confrontation with said “reformed” priest was baffling. Openly admitting to everything. John Slattery did his best BUT he will always be Roger Sterling from Mad Men. The office attire and quick witted one liners didn’t help his case. The closing act, aided by more harrowing facts, really hit home. I couldn’t believe that the original news story was “buried” years before. And the scale. So many stories. The States being only the tip of the iceberg. The pace may have tested in parts. BUT that didn’t spoil what was a harrowing and insightful drama. One that I never expected to be so engrossed in. All aided with a superb cast makes this one to watch. I loved Spotlight! It is an outstanding movie. Well-acted, well-written, well-directed. It is never overdramatised, it doesn’t comes across as contrived. Spotlight is different from other dramas and “Oscar-worthy” movies. In addition to laying bare the effects of child abuse at an institutional level, the movie is a love letter to investigative journalism. In a time where crappy “news sites” like Buzzfeed and the Daily Mail are popular, it is more relevant than ever. Whether it deserves to win Best Picture at the Oscars is a different story, but it doesn’t change the fact that Spotlight is an outstanding movie. It is a shame that this film will be forgotten since it was nominated and won an Oscar. Absolutely. It was a fantastic film. I know that The Revenant and Spotlight are different genres but I felt that Best Film Oscar was rightly deserved and I’ll certainly remember this over Leo fighting a bear. The Revenant is one of the two movies that I didn’t see which was best picture nominations.